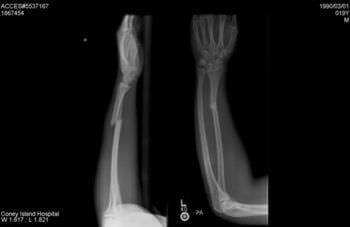 New discovery of how bone fractures heal may lead to new ways of treatment. “A team of Vanderbilt investigators has discovered that fibrin, a protein that was thought to play a key role in fracture healing, is not required. Instead, the breakdown of fibrin is essential for fracture repair. The findings, reported in the August issue of the Journal of Clinical Investigation, shift understanding of how fractures heal and have implications for efforts to promote fracture repair. Fibrin is involved in blood clotting; it forms a meshlike net that traps platelets to form a clot. When bones break, so do blood vessels, and clots form to stop the bleeding. Since fibrin is the main protein at the site of a fracture, it was thought to promote repair by providing a scaffold for the initial phase of new bone formation. Schoenecker and colleagues found, however, that fracture repair was normal in mice missing the fibrin precursor fibrinogen. The investigators had previously reported the importance of vascular re-connection for bone fracture healing. Using imaging techniques they developed to simultaneously study angiogenesis (new blood vessel growth) and bone formation after fracture, they found that blood vessels grow first at the ends of the fracture, extend and reconnect. Then new bone forms.